Having to work the next day at 5:45am as a conductor on a train to Chicago, I had little time to decide what to do. I made the decision to call off work and drive up that very same evening, just one day before this supposed special and maybe just maybe they would bring out a Baldwin. I called a buddy of mine up and said hey do you have to be anywhere the next day or two? Okay then I'll be over in an hour, we are driving to Escanaba! Yes, that is how an 8 hour drive began. It was just the beginning of the week prior to memorial day and the higway was empty as we headed north. We reached the straits of Mackinac by midnight or so and crossed the mighty Mackinac Bridge in some light fog. Between her suspension cables the dark waters lay below for the next 5 miles. It was spooky and serene all at the same time, much like a dream. A slow drive across highway 2 followed our crossing, but we picked up a classic rock station on the FM radio and set the cruise, ocasionally slowing down for deer, racoons, or the ocassional logging truck. It was still dark when we arrived in Escanaba and we took time to scout things out. We even drove by the north shore boat launch next to the ELS roundhouse. It wasnt even 4am when a headlight beam of a vehicle shown brightly in our face. It was probably someone arriving to work early but we didnt take our chances having heard the stories of railfans being not welcome near the shops and so we headed for a different spot in town off the bay to watch the sun come up before returning to the railroad tracks in Wells after sunrise. Once the sun came up it was akin to fishing. The minutes turned to hours and it was sit and wait. There was not much to see. 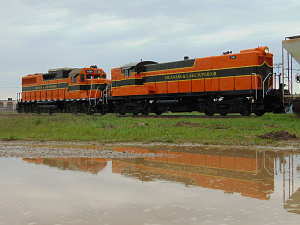 Some time after 7am they fired up an old reserve mining SD9 but it just sat there idling. We headed over to the north side of Escanaba/Wells and followed the original Escanaba and Lake Superior line for a ways counting the various storage cars on this no longer traveled through segment of track. Having scouted out the tracks in town and learning the layout we were just heading back to the boat launch when our handhled radio squacked "ELS 300 radio check" "you want us to back onto that 400?" And so the adrenalin was on. We turned the corner to find the holy grail of Michigan diesels gleaming in all her glory! The Dupont brand Imron finish was carefully waxed and the freshly painted undercareiage was truly a sight to behold and so began our chase of a Baldwin in the north woods! 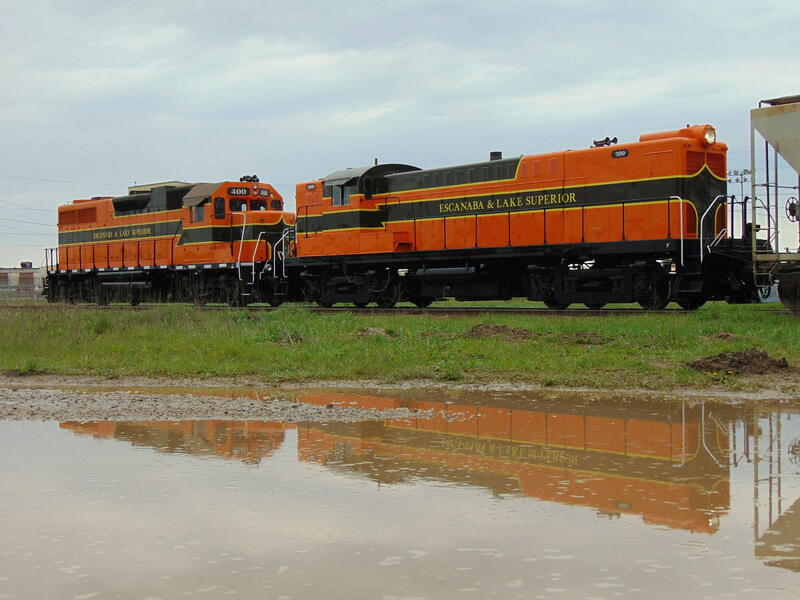 ELS 300/400 are reflected in the mud as they switch cars in Escanaba.